Home renovations Coquitlam: this house was transformed from a 1960s bungalow into this stunning three story home. This award-winning home renovation incorporates natural wood beams, glass (including a 20 foot glass wall letting natural light into all floors, and a huge glass staircase), metal and concrete for a modern industrial look. The warm, neutral colour palette creates a subtle backdrop for these varied textures to shine through. As the videos lower on this page show, one of the intents on this project was to bring the outdoors in. Off the kitchen, we installed a glass nano wall which folds out of the way to allow seamless passage from kitchen to deck. On a different level, on the deck accessed from the glass door leading out of the spa-like master bathroom, we installed a hot tub so home owners could enjoy the North Shore mountain views from their own private sanctuary. For the kids, two beautiful, functional rooms were created with an adjoining loft between them for quiet, secret play. 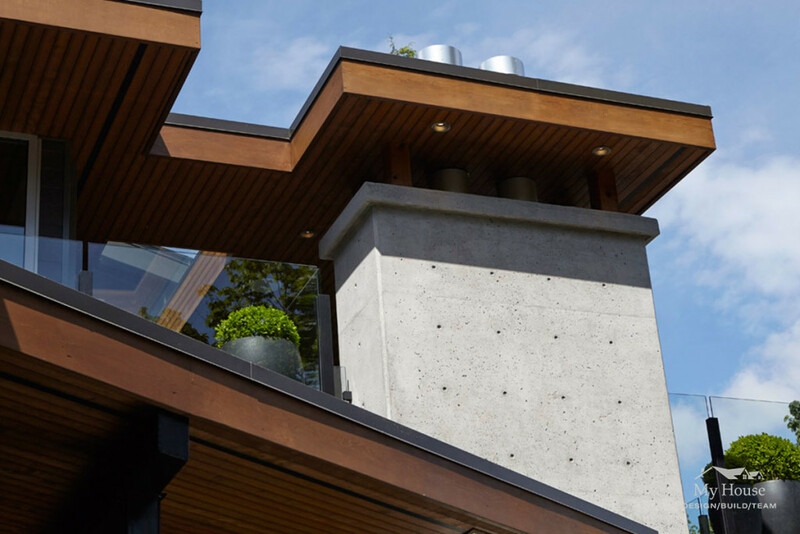 Home renovations Coquitlam, custom homes Coquitlam by the My House Design Build team. Contact us to discuss your home renovation project.